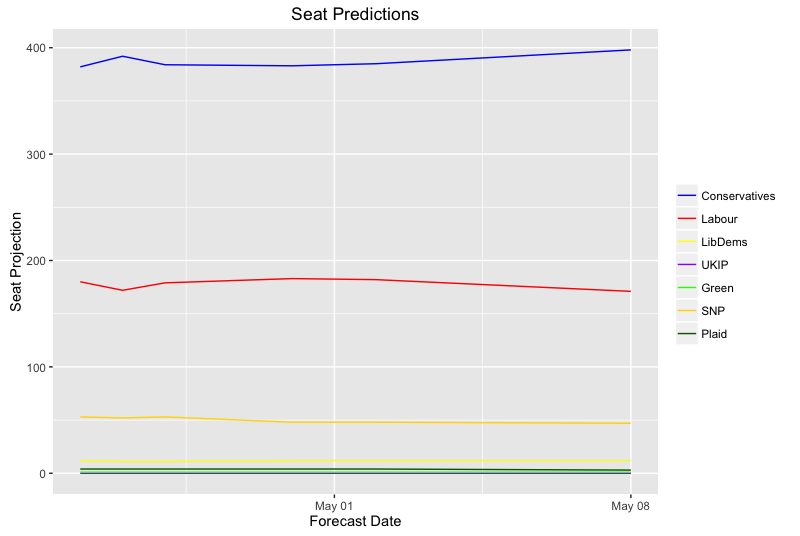 Today's forecast is the first update to PME Politics predictions since May 2nd. 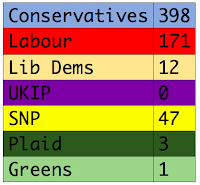 It includes the ICM poll released this afternoon, which gave the Conservatives a record (for ICM) lead of 22 points. Much has happened since the last forecast, including last week's Local Election results (a resounding Conservative win) and Dianne Abbott's ill fated LBC interview. Since then, the Conservatives have since apparently reestablished much of a polling lead which appeared to have been cut somewhat over the week previous by the Labour Party. 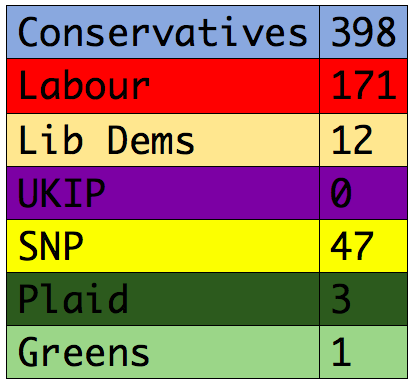 The rolling 7 day average of polls applied to the uniform swing model today produced the following result: Conservatives 403, Labour 165, Lib Dems 6, UKIP 0, SNP 54, Plaid 3, and Greens 1. 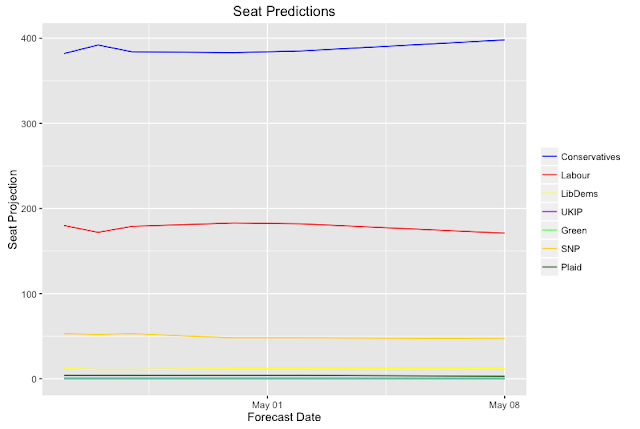 The projection has the Conservatives significantly up on the last forecast produced, with Labour someway down and both the SNP and Plaid also down a seat each. The Lib Dems are fairly stable, but seemed to have made some ground in recent polling which may see their forecasted seats rise, if it is sustained into later this week. 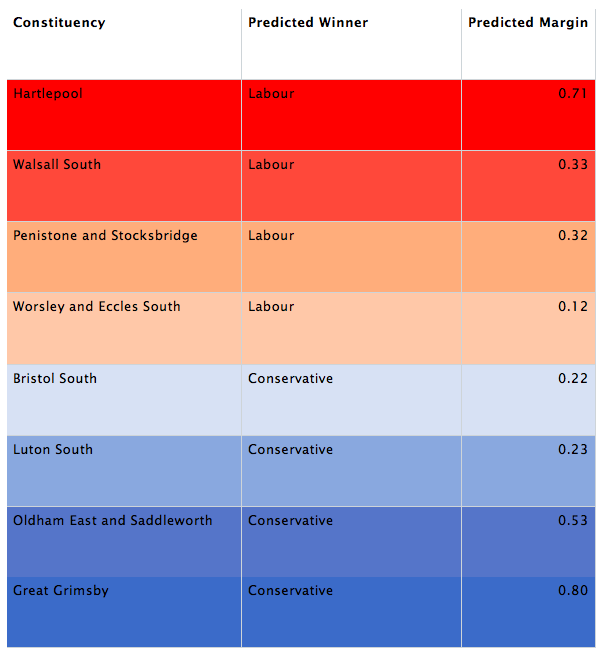 The current model forecast moves the Lab/Con marginal line further down the Labour path, putting the Tory Tanks right outside the outskirts of both Manchester (Worsley and Eccles South) and Sheffield (Penistone and Stocksbridge), having already blitzed through the previously safe Labour territories in the South of Bristol and Luton. Just how might the Conservatives really deliver a result which sees them push towards 400 seats, only a few years after many questioned their ability to even build a majority again after the Thatcher and Major years? The general pattern of last week's local election contest was of the Conservatives hoovering up UKIP votes in order to bypass the other parties and fly into 1st spot in over 500 council seats across the country. There is every reason to suspect that this may well happen again in next month's General Election, as former UKIP voters continue to abandon their previous party in support of Theresa May and her "Brexit means Brexit" agenda. The number of Labour held seats in which the total Conservative plus UKIP vote share is greater than the Labour Party vote share is well over 150 (credit to Steve Fisher over at electionsetc.com for that one). If the Conservatives are once again successful in mopping up UKIP support, then the sky really may be the limit for the size of their landslide.